What do you think Nike's "something" is? * Air Jordan 1 Retro Hi OG "Black Toe"
* Air Jordan 3 Retro "Fear Pack"
* Air Jordan 4 Retro "Fear Pack"
* Air Jordan 4 Retro "Fire Red"
* Air Jordan 4 Retro "Military Blue"
* Air Jordan 5 Retro "Grape"
* Air Jordan 5 Retro "Black Grape"
* Air Jordan 5 Retro "Fear Pack"
* Air Jordan 5 Retro "Laney"
* Air Jordan 5 Retro "Bel Air"
* Air Jordan 5 Retro "Fire Red"
* Air Jordan 6 Retro "Infrared 23"
* Air Jordan 10 Retro "Powder Blue"
* Air Jordan 10 Retro "Steel"
* Air Jordan 11 Retro "Gamma"
* Air Jordan 11 Retro "Black/Red"
* Air Jordan 13 Retro "Black/Varsity Red"
* Air Jordan 13 Retro "Squadron Blue"
After seeing this list, what are your thoughts? Are you anticipating the new launch date even more? Virtually every major sneaker retailer has thrown their hat in the mix for some kind of restock tomorrow morning. Strangely, NikeStore wasn't a part of that mix — until now. Moments ago, the NikeStore Twitter sent out a curious tweet teasing something for Jordan fans tomorrow morning at 10:00 a.m. EST / 7:00 a.m. PST. Now, we can't confirm that it's a restock, but that would be consistent with everything else taking place. What do you think Nike's "something" is? Share your guesses with us below and stick with Sole Collector for any possible updates. 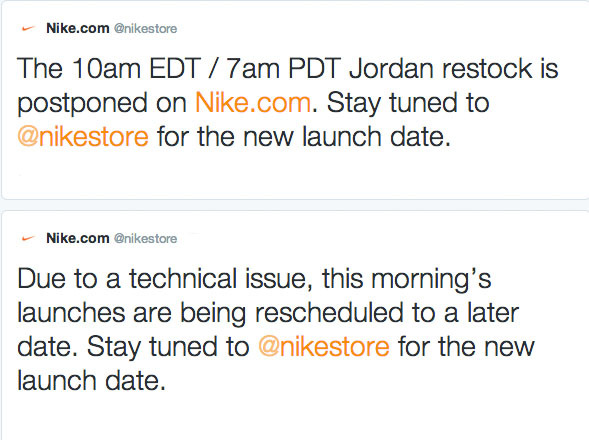 Edit: It turns out that Nike didn't have something special for Jordan fans this morning. The restock (now confirmed) has been postponed with the new launch date yet to be announced. We'll keep you updated here as new details emerge.